Abstract. Ice flow forced by gravity is governed by the full Stokes (FS) equations, which are computationally expensive to solve due to the nonlinearity introduced by the rheology. Therefore, approximations to the FS equations are commonly used, especially when modeling a marine ice sheet (ice sheet, ice shelf, and/or ice stream) for 103 years or longer. The shallow ice approximation (SIA) and shallow shelf approximation (SSA) are commonly used but are accurate only for certain parts of an ice sheet. Here, we report a novel way of iteratively coupling FS and SSA that has been implemented in Elmer/Ice and applied to conceptual marine ice sheets. The FS–SSA coupling appears to be very accurate; the relative error in velocity compared to FS is below 0.5% for diagnostic runs and below 5% for prognostic runs. 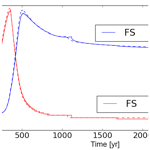 Results for grounding line dynamics obtained with the FS–SSA coupling are similar to those obtained from an FS model in an experiment with a periodical temperature forcing over 3000 years that induces grounding line advance and retreat. The rapid convergence of the FS–SSA coupling shows a large potential for reducing computation time, such that modeling a marine ice sheet for thousands of years should become feasible in the near future. Despite inefficient matrix assembly in the current implementation, computation time is reduced by 32%, when the coupling is applied to a 3-D ice shelf. How to cite: van Dongen, E. C. H., Kirchner, N., van Gijzen, M. B., van de Wal, R. S. W., Zwinger, T., Cheng, G., Lötstedt, P., and von Sydow, L.: Dynamically coupling full Stokes and shallow shelf approximation for marine ice sheet flow using Elmer/Ice (v8.3), Geosci. Model Dev., 11, 4563-4576, https://doi.org/10.5194/gmd-11-4563-2018, 2018.